Britain has many beautiful wild flowers. This is our guide to some of the wild flowers that you might find in woodlands and hedgerows. This is a new part of our site and the wild flowers / plants described here will 'grow' with time (see the list on the right); it is, however, a 'work in progress'. The categorisation of the flowers by colour is a bit 'rough and ready', but it should help narrow down choices somewhat. It is often possible to identify various woodland / wild flowers by looking for a number of 'key features' of the leaves and / or flowers. Leaves are generally speaking broad, flat, and thin. These features allow them to intercept light for photosynthesis and allow gases to enter or leave the leaf easily. The flat surface of the leaf is termed the leaf blade or lamina, as seen in the photo to the left. The top surface (or adaxial surface) of the leaf is often very different from the lower (or abaxial) surface. 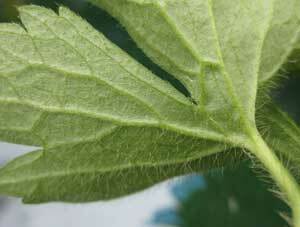 For example, the lower surface may be hairy (many different technical words are used to describe the hairiness of a leaf) - but do look to see whether there are hairs on either or both surfaces), or if the surfaces are a different colour / shade, or look at the veins of the two surfaces, they may be more obvious on one surface - raised or sunken. The leaf is usually joined to the stem of a plant by a stalk; this is called the petiole. The angle that the petiole makes with the stem of the plant is termed the leaf axil. The tip of the leaf is sometimes referred to as the apex of the leaf. The edge of the leaf is known as the leaf margin. Looking at the margin of the leaf can be an important in identifying the leaf. Leaf margins may be described as entire, toothed, or lobed. 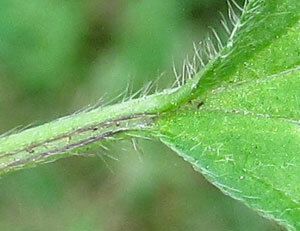 The leaf stalk and blade in the adjacent photo are clearly hairy. Leaf arrangement or phyllotaxis is another feature of leaves that may help in you in identifying a plant / flower. This how they are arranged on the shoots. Look at a stem. How are the leaves arranged? Do they occur in pairs? Are the pairs set at right angles to each other or are they arranged singly and alternately ? Do they 'spiral' around the stem? 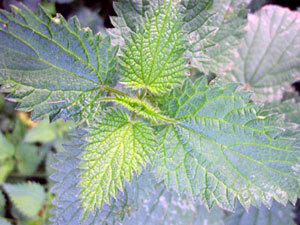 In the nettle (see adjacent photo), the leaves are arranged in pairs and each pair is set at right angles to the previous pair. Features of the flower to look for. Petals : the petals are often the most obvious feature of a flower. They are may be brightly coloured to attract insects, and have nectaries (offering a sugary solution as a 'reward' for the bees, moths, butterflies.....). 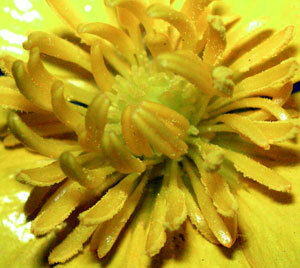 Some petals are highly reflective, like those of the buttercup family (see adjacent photo). The number of petals present is an important feature of a flower but look at several flowers as the number can vary. Collectively the petals are known as the corolla of the flower. 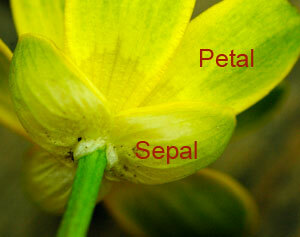 Sepals : the sepals lie outside the petals. Generally their 'job' is to protect the petals in the formative bud stage. Collectively they are termed the calyx of the flower. Whilst they are often green, they can be almost indistinguishable from the petals. When petals and sepals are similar they may be referred to as tepals, and the structure of the petals and sepals called a perianth. Stamens : these are the male organs of a flower. They produce the pollen. The pollen is produced in the anthers, which are held at the end of the filaments. A flower may have a 'low' number of stamens - 2,3 4 or 5 or there may be lots (as in the buttercup - see photo), in which case the number is sometime said to be infinite. Collectively the stamens of a flower are referred to as the androecium. Most flowers are hermaphrodite, that is, they have male and female structures present but some are unisexual. Unisexual flowers will have either male organs - anthers, or female structures - the style, stigma and ovary. The pollen forms within the sacs of the anthers and when it is mature, the anthers split open (dehisce) and release the pollen. Style, stigma and ovary : these structures form the female part of the flower - the carpal or carpals, which collectively constitute the gynaecium. 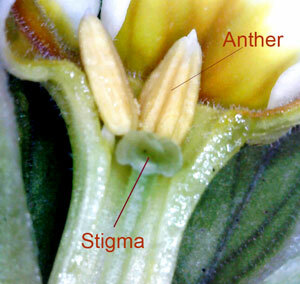 In some flowers, there is a single stigma, style and ovary whereas others have many. The stigma is a receptive surface for pollen grains. The pollen grains germinate here sending tube-like structures down through the style (a filament that supports the stigma) to the ovary. Pollination is the transfer of pollen grains from anthers to stigma, fertilisation is when a nucleus from a pollen grain meets with a female nucleus contained within an ovule within the ovary. A fertilised ovule develops within the ovary into a seed. Botanically speaking, the ovary becomes a fruit which encloses / contains the seeds. The fruit may be in the form of a berry (such as those on honeysuckle or deadly nightshade), or an achene ( a one-seeded fruit) as in the little 'pips' on the outside of a strawberry, or an aggregate fruit such as the blackberry or the ovary wall may dry out to form a structure that helps disperse the seeds -for example, the capsule of the poppy. The classification of the different types of fruit can become quite complex. The structure underneath the flower into which the various parts are connected is the receptacle. 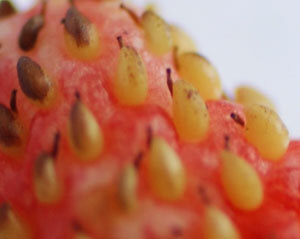 Sometimes the receptacle enlarges after fertilisation to form the edible / fleshy part of a fruit - as is the case of the strawberry (sitting on its surface are the many one seeded fruits - the achenes). Some flowers, for example, those of daisies are a bit more complicated than this. What appears to be one flower is, in fact, many 100's of flowers or florets 'squeezed' together to form a single structure that looks like a single flower. These are composite flowers - found in members of the family Compositae or Asteraceae; asters and sunflowers fall into this family, as do the common weeds - dandelion and groundsel. Ecology and other notes (in this context) refers to the habitat / environment of the plant - such as preferred soil type, particular associations with other species, geographical distribution (with reference to the excellent maps of the Botanical Society of the British Isles. It may also include notes on herbal or other uses of the plant / plant infusions. Useful books on wild flowers of the UK. The Vegetative Key to the British Flora by J. Poland and E.J. Clement.